What is the Juyong Pass? Situated 60 kilometers from Beijing and 20 kilometers away from the Great Wall of China(Badaling), Great Wall of China (Juyong Pass). It is an important pass for the Great Wall of China. ​It was built in a 15-kilometers valley with mountains on both sides and lush trees. Open to the public since March 1998, Great Wall of China (Juyong Pass) has gone through 4 years’ repair. Upon walking through the entrance of the scenic area, you will see Juyongguan Scenic Spot Square. There is a white stone gate named Yuntai. The gate is a Tibetan Buddhist architectural treasure. On the two walls of the Yuntai's internal passageway, there are beautiful and unique Buddha statues. In the scenic area, visitors can explore many cultural attractions such as Guanyu Temple, Diecui Academy, Lvzu Temple, Chenghuang Temple, Temple for Showing Fidelity, Fengyu Barn, etc. The sites also record the history of Juyongguan. Visitors also can hike along the bank of a small lake. After visiting the tower, you can climb the Great Wall of China (Juyong Pass). Usually, it always takes your 2 - 3 hours to hike up to highest beacon tower on the Great Wall. When you stand on the tower, the natural beauty will feedback you with one of the eight famous views in Beijing - Juyong Diecui. 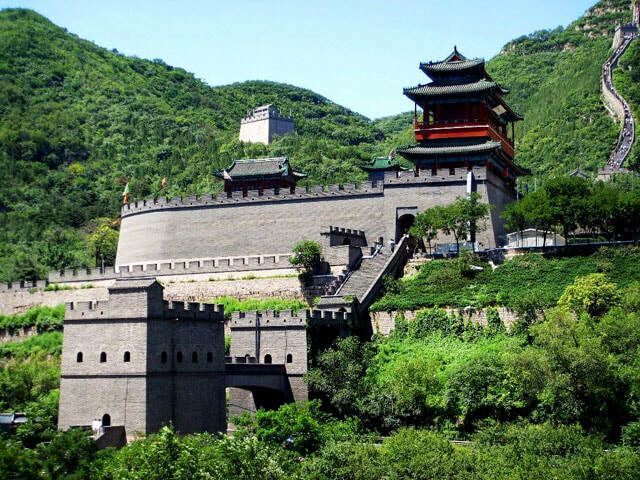 The best months to visit Great Wall of China (Juyong Pass) are from March to June and from September to November. There is only one direct public bus to Great Wall of China (Juyong Pass). Therefore, there are only a few options. First, take Bus 345 at Desheng Gate to the Stop of Shahe (沙河站). Then transfer to Bus Chang 68 to the Stop of Juyong Pass (居庸关站). First, take Bus 833 at Desheng Gate to the Stop of Nankou Dongjie (南口东街站). Then transfer to Bus Chang 68 to the Stop of Juyong Pass (居庸关站). As at 27th September 2018, between April 1 and October 31, entrance pricing is 45 CNY per person; between November 1 and March 31, entrance pricing is 40 CNY per person; children under 1.2m tall are free of charge. Please take enough drinking water and food with you. It is not suggested to explore it on weekends or the public holidays. The section of Great Wall of China is relatively steep. Please take care of yourself. Interested in visiting the Juyong Pass on a Tour? Wendy Wei Tours offers a variety of different packaged tours as well as custom tours including the Juyong Pass, among other attractions and destinations. To find out more, please visit our Tours page or Contact Us directly to find out more.